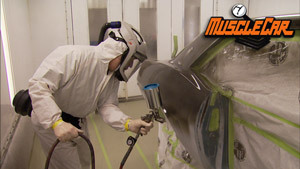 (ANNOUNCER)>> TODAY ON MUSCLE CAR THE COPO TRIBUTE CAMARO GETS THE FINISHING TOUCHES AND COMES TO LIFE. 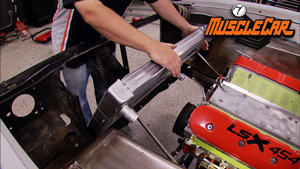 SEE HOW WE INSURE THAT BIG BLOCK IS PREPPED TO FIRE AND THEN TUNED TO RUN LIKE AN ANIMAL. THEN WATCH AS WE TAKE HER OUT AND SEE JUST HOW MEANS SHE CAN BE. (MANK)>> WELL IT'S BEEN A GOOD LONG WHILE SINCE OUR '69 CAMARO COPO TRIBUTE CAR ROLLED IN THE DOOR BUT TODAY THE BEST PART, WE GET TO DRIVE IT. (TOMMY)>> AND ONE THING'S FOR SURE, THIS OLD GIRL'S CAME A LONG WAYS IN THE SHORT AMOUNT OF TIME IT'S BEEN HERE. THE WHOLE THING STARTED RIGHT HERE WITH A LIMITED ANNIVERSARY EDITION ZL ONE 427 FROM CHEVROLET PERFORMANCE. BOASTING AN ALL ALUMINUM CONSTRUCTION AND HIGH PERFORMANCE INTERNALS, THIS THING IS RATED AT 430 PONIES, BUT THAT RATING IS FAR SHY OF ITS TRUE POTENTIAL. 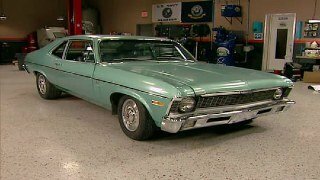 (MANK)>> THEY WERE MODELED AFTER THE ICONIC CROWN JEWEL OF THE CHEVROLET BIG BLOCK FAMILY. THE ORIGINAL ZL ONES WERE CLOSE TO 500 HORSEPOWER FEATHER LIGHT FIRE BREATHING MONSTERS THAT WERE ORIGINALLY DESIGNED FOR USE IN CAN AM RACE CARS. BUT 69 LUCKY FBODIES WERE A RARE RECIPIENT OF THESE ENGINES AS SPECIAL ORDERED CENTRAL OFFICE PRODUCTION ORDERS, THE LEGENDARY ZL ONE COPO CAMAROS. (TOMMY)>> ONLY 427 OF THESE NEW ZL ONES WERE EVER PRODUCED, AND OURS IS ONE OF THE LAST, NUMBER 426. IT CAME WITH A PERIOD CORRECT HOLLEY FOUR BARREL CARB, A SPECIAL CERTIFICATE OF AUTHENTICITY, AND EVEN A LIMITED EDITION JACKET. (MANK)>> BUT WE NEEDED A CAR TO BUILD AROUND THAT BIG BLOCK. 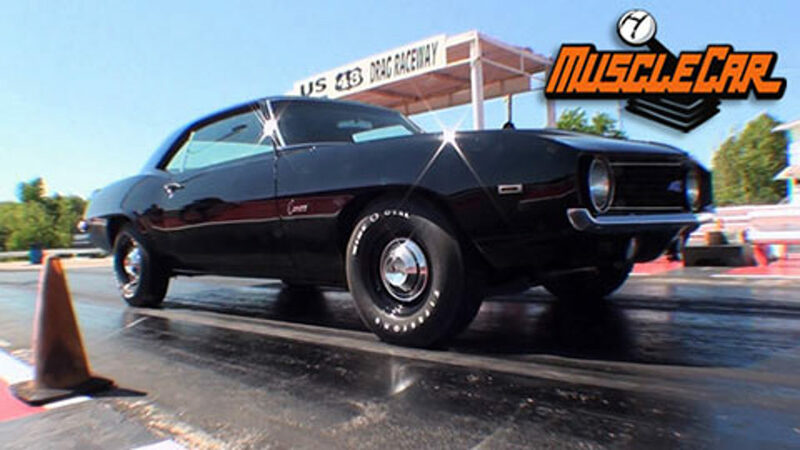 WE FOUND THE PERFECT PLATFORM IN THIS, A SMALL BLOCK '69 CAMARO THAT HAS BEEN WELL CARED FOR OVER THE YEARS. IT REQUIRED A MINIMUM AMOUNT OF BODY WORK, AND SURPRISINGLY THE OWNER HAD ALL THE DOCUMENTATION FOR THE CAR INCLUDING THE ORIGINAL SALES RECEIPT. THING THAT HAD TO COME OFF WAS THE CHROME. 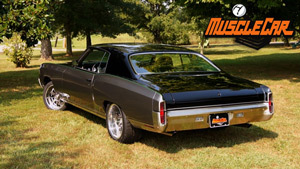 (MANK)>> TOMMY NARROWED AN IMPALA 12 BOLT REAR END AND THE SUSPENSION WAS PLUGGED INTO PLACE. 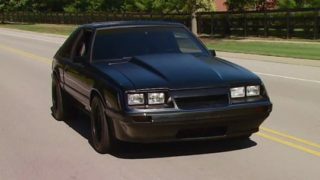 (TOMMY)>> A COAT OF BLACK GAVE IT THE SINISTER LOOK WE WERE AFTER, AND A MODERNIZED FOUR SPEED WILL SIT BEHIND OUR 427 AND DRIVE OUR STEEL WHEELS. (MANK)>> WE LAID DOWN SOME HEAT INSULATION ON THE FLOOR BOARD TO KEEP THE INTERIOR NICE AND COOL. THEN INSTALLED OUR CLUTCH KIT FOLLOWED BY OUR NEW TRANSMISSION. THE SEAT FRAMES HAD TO BE REPAIRED IN A FEW PLACES. THEN WE GAVE THEM NEW FOAM AND COVERS. AFTER THAT WE REBUILT THE STEERING COLUMN, AND TOM USED SOME EPOXY TO REPAIR THE PLASTIC PARTS OF THE GRILL. THE TRUNK NEEDED SOME ATTENTION TOO, SO WE REFINISHED IT AND USED SOME SPATTER PAINT. (TOMMY)>>> AND A SET OF LONG TUBE HEADERS WILL HELP MOVE THAT SPENT FUEL OUT OF OUR STAINLESS EXHAUST. MOTOR WE'RE GONNA USE SOME OF JOE GIBBS' DRIVEN BREAK IN OIL. THIS BREAK IN OIL IS USED BY JOE GIBBS RACING TO BREAK IN AND DYNO ALL THEIR ENGINES. THE ADDITIVES PROMOTE RING SEAL AND PROVIDE PROTECTION FOR CAM AND LIFTERS DURING INITIAL BREAK IN. IT'S ALSO GOOD FOR FULL POWER PULLS ON THE DYNO, ONE NIGHT OF RACING, OR UP TO 400 MILES ON THE STREET BEFORE IT HAS TO BE CHANGED. (TOMMY)>> NOW IF YOU'RE IN THE MARKET FOR A CRATE ENGINE, THERE'S ONE THING YOU WANT TO KEEP IN MIND. YOU HAVE NO IDEA OF HOW LONG THAT THING'S BEEN SETTING IN SOME WAREHOUSE WHENEVER IT SHOWS UP AT YOUR DOOR STEP. SO YOU WANT TO MAKE SURE TO PRIME THE ENGINE BECAUSE WHENEVER THEY ASSEMBLE THAT ENGINE, THEY USES A LUBE TO MAKE SURE EVERYTHING'S ALL NICE AND WET. AND EASY ALTERNATIVE. YOU CAN USE AN OLD DISTRIBUTOR TO MAKE ONE. FIRST STEP TO GETTING THERE IS YOU'VE GOT TO GET IT APART. YOU'LL WANT TO BEGIN BY TAKING A PUNCH AND KNOCKING OUT THIS ROLL PIN, WHICH WILL ALLOW YOU TO GET THE DISTRIBUTOR GEAR OFF. THEN I'LL GRAB SOME WD 40 TO HELP LOOSEN UP THE OLD BUILD UP, WHICH ACCUMULATES ON THE SHAFT. THE TOP OF THE HOUSING NEEDS TO COME OFF TO ALLOW US TO ATTACH A DRILL FOR PRIMING. NOW I'VE JUST GOT TO DO THE SAME THING TO THE SHAFT. BE STICKING THIS THING IN YOUR ENGINE. YOU WANT IT TO BE CLEAN. IT IN PLACE THAT WAY WHEN WE'RE ALL SAID AND DONE, IF YOU DIDN'T HAVE IT ON THERE, THE SHAFT WOULD JUST FALL OUT OF THE HOUSING. SEE, THERE'S NOT THAT MUCH TO IT. JUST CHUCK THIS THING INTO A DRILL AND YOU'RE READY TO PRIME. WE JUST GOT PRIME. (ANNOUNCER)>> STILL AHEAD WE TUNE THE TIMING AND THE CARB ON THE ZL ONE BIG BLOCK AND SHOW YOU HOW TO DO IT TOO. THEN THE CAMARO ROLLS OUT ON HER MAIDEN VOYAGE. GUYS NUMBER ONE TO BE. OF COURSE FOR THEM TO REMEMBER POSITIONING, AND ALSO GET THE FIRING ORDER CORRECT. SO WHAT WE'LL DO IS DROP IT IN THE BACK TO SEE IF IT WILL GO IN FACT ALL THE WAY IN WHERE WE'D LIKE IT TO BE. IF IT DOESN'T WHICH IT DOESN'T SEEM LIKE IT'S GOING TO DO, BY TURNING THE GEAR, WE'LL PULL IT BACK OUT. AND WE CAN USE TOMMY'S TOOL TO TURN JUST THE PUMP AND PUT THE BLADE FOR THE DISTRIBUTOR IN THE POSITION WE WANT IT TO BE IN TO GET THE ROTOR TO FACE WHERE WE WANT IT TO BE ON THE MOTOR FOR CYLINDER NUMBER ONE. WE'VE MADE SLASH ON THE TOP OF THE DISTRIBUTOR SHAFT TO SHOW US WHICH WAY THE BLADE IS POINTING NOW INSIDE THE MOTOR. WE'VE GOT IT TURNED TO WHERE WE WANT IT TO BE, APPROXIMATELY IN THE AREA WHERE NUMBER ONE IS ON THIS DISTRIBUTOR. NOW WE'LL PULL IT BACK OUT, REINSERT THE DISTRIBUTOR, AND TURN THE ROTOR, NOT BAD. AND HERE'S ANOTHER LITTLE INTERESTING PIECE OF INFORMATION YOU GUYS MIGHT WANT TO KNOW. 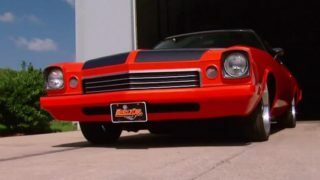 CHEVROLET MOTORS, BOTH BIG AND SMALL BLOCK, THE ROTOR ROTATES IN A CLOCKWISE DIRECTION AND THE FIRING ORDER IS ONE, EIGHT, FOUR, THREE, SIX, FIVE, SEVEN, TWO. ON INITIAL START UP WE LIKE TO USE WATER INSTEAD OF ANTIFREEZE JUST IN CASE THERE'S A LEAK. AND IT JUST SO HAPPENS WE FOUND ONE ON A PIPE PLUG ON THE PASSENGER'S SIDE OF THE ENGINE. JUST A DAB OF LOCTITE THREAD SEALANT AND THIS WILL FIX IT UP. (TOMMY)>> WELL HERE WE ARE. SOUTH, I'LL KNOW IT BEFORE IT GETS BAD. MANKFORD, HE'S GONNA DO SOME TUNING OUT THERE. THIS IS WHEN YOU BRING THE MOTOR UP TO TEMPERATURE TO BEGIN THE BREAK IN PROCESS. WE'LL BE DOING SOME INITIAL ENGINE TUNING WHILE WE'RE AT IT, BUT YOU WANT TO MOVE PRETTY QUICKLY TO GET IT ALL SET. YOU CAN START BY TUNING IT BY EAR. THEN YOU ALSO ADJUST THE IDLE SCREW TO BRING THE ENGINE UP TO A GOOD RPM RANGE FOR WHAT WE'RE DOING RIGHT NOW. 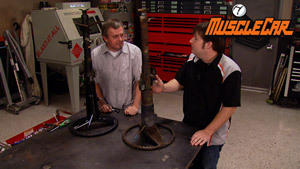 (MANK)>> HOW MUCH OIL PRESSURE WE GOT TOM, WE GOOD? (TOMMY)>> YEAH, WE'VE GOT PROBABLY 60 POUNDS. (MANK)>> THAT'S GOOD, NOW THE REAL TIMING CAN BEGIN. WE'LL BUST OUT THE TIMING LIGHT, AND IT LOOKS LIKE WE'RE RUNNING PRETTY HIGH, 34 DEGREES. THIS BIG BLOCK LIKES TO SIT DOWN AROUND THE NEIGHBORHOOD OF 15 DEGREES INITIAL TIMING. (TOMMY)>> DURING INITIAL TIMING THE VACUUM ADVANCE IS LEFT OFF, BUT WE RECONNECTED IT WHILE WE LET THE ENGINE WARM UP TO ADJUST THE CARBURETOR. WE'LL THEN UNHOOK IT TO RUN IT TO THIS LITTLE JEWEL, WHICH IS A VACUUM GAUGE THAT WE'LL USE TO DIAL IN OUR CARB. (MANK)>> THE NEEDLE MIGHT FLUCTUATE ON YOU, ESPECIALLY DEPENDING ON YOUR CAM. JUST KEEP AN EYE ON THE NEEDLE'S HIGHEST POINT. THAT'S ONE SIDE. REALLY GOOD, BUT THAT'S ENOUGH FOR THE LABORATORY. IT'S TIME FOR SOME PRACTICAL APPLICATION. (TOMMY)>> YEAH I'D AGREE WITH THAT TO DISAGREE THERE'S ONE OR TWO SMALL THINGS WE SHOULD TAKE UP BEFORE WE. (TOMMY)>> I DO HAVE A PAIR OF SHADES. (ANNOUNCER)>> STICK AROUND AND SEE THE COPO SPREAD ITS BIAS PLY WINGS AND FLY. THIS CAR WAS BUILT TO BURN RUBBER AND IT TREATS THOSE REAR TIRES LIKE A PAIR OF ROLLER SKATES. 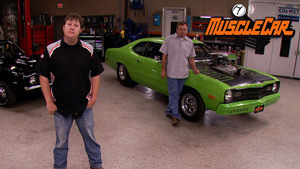 (TOMMY)>> NOW I HAVE TO SAY THIS OLD CAMARO IS ONE OF THE FUNNEST BUILDS THAT WE'VE GOTTEN TO DO. I GUESS IT DOESN'T GET MUCH MORE ICONIC THAN THIS. 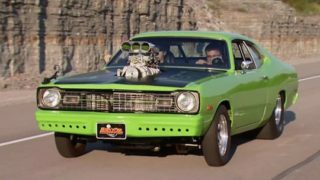 THERE'S NO DENYING THAT THIS CAR IS A MUSCLE CAR. IT HAS THE LOOK, IT HAS THE STANCE, SHOOT IT EVEN HAS THE SMELL. YOU KNOW ONE THING, IT'S GOT THE POWER. THIS ALUMINUM BIG BLOCK AIN'T NO JOKE. SO LETS TAKE IT FOR A CRUISE AND SEE HOW SHE DOES. (MANK)>> FEELS LIKE AN OLD MUSCLE CAR. (TOMMY)>> KINDA LIKE WHAT THEY'RE SUPPOSED TO FEEL LIKE. (TOMMY)>> IT'S THE TYPE OF GAS PEDAL, IF YOU'RE GONNA SNEEZE, TAKE YOUR FOOT OFF THE GAS. (MANK)>> MY TEMPERATURE IS RUNNING GOOD, IT HAS NOT MOVED AT ALL. WE'VE GOT REAL GOOD STEADY OIL PRESSURE. FUEL, IT JUST SAYS CONSUMING. AS FUN AS IT IS TO BUILD THESE CARS, YOU KNOW WHAT WE ALWAYS SAY, IT'S MORE FUN TO GET OUT AND DRIVE THEM. WE DON'T TEND TO GRAVITATE TOWARDS TRAILER QUEENS. (TOMMY)>> WELL LOOKS LIKE MANK SNEEZED AGAIN. (MANK)>> I THINK THAT WORKED. AFTER A LONG HARD DAY OF BURNOUTS AND SUNSHINE, WE DECIDED WE'D SHIMMY UP TO NASHVILLE AND SEE IF WE COULD SHOW THE CAR OFF A LITTLE BIT. (RANDALL)>> IT'S A BEAUTIFUL CAR WITH THE ORIGINAL HUB CAPS AND EVERYTHING. THAT'S THE TOUCH RIGHT THERE, THE ORIGINAL HUB CAPS. YOU KNOW MOST EVERYBODY PUT MAGS ON THEM OR WHATEVER. (MICHAEL)>> I ACTUALLY GOT BEAT BY A '69. 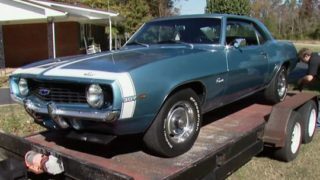 I HAD A '72 CUTLASS OLDS, HAD THE 350 ROCKET IN IT. MUSCLE CARS IS BETTER CARS, STRONG CARS. THESE HERE WILL GO THROUGH A BUILDING. (MANK)>> WELL GUYS, BEFORE WE CALL IT A DAY WE'VE GOT ONE MORE THING WE WANT YOU TO SEE. (TOMMY)>> SO WE SWUNG BY US 43 DRAGWAY JUST TO SEE WHAT THIS OLD GIRL HAD IN HER. SHE DID PRETTY WELL ON OUR FIRST RUN. WE'RE LOOKING AT 854 IN THE EIGHTH MILE AT 87.8 MILES PER HOURS. YOU MAY NOTICE THAT IT'S PRETTY TRICKY COMING OUT OF THE HOLE. THOSE BIAS PLYS ARE BEING PUSHED TO THEIR LIMIT FOR SURE. WE BROUGHT THE AIR IN THE TIRES DOWN FROM 34 POUNDS TO 28. MANKED JUMPED IN FOR A RUN. LOW AND BEHOLD, MY FEEL FOR IT WAS A LITTLE HOT FOR THE FIRST RUN AND I PROBABLY PUSHED IT TOO HARD MISSING A SHIFT. (TOMMY)>> YOU MAY REMEMBER BACK AT THE SHELBY MEET IN TULSA I DID THE SAME THING IN A GT 500. (MANK)>> AND THIS IS THE FACE OF SOMEONE WHO JUST MISSED SECOND GEAR. (TOMMY)>> NOW I DON'T KNOW IF YOU GUYS GOT TO SEE ALL THAT AND I SURE HOPE YOU DID BECAUSE THAT RIGHT THERE, THAT SOUND BOOM, POW, THAT'S WHAT IT SOUNDS LIKE WHEN YOU MISS SECOND GEAR TOO. REMEMBER THAT, REMEMBER WHAT YOU SAID, I DO. (MANK)>> ONE MORE TRY AND I'M FINDING THAT THESE TIRES STILL CAN'T EVEN BEGIN TO HANG WITH THE POWER THIS CAR'S MAKING UNDER THE HOOD, BUT AT LEAST WE'RE HAVING A GOOD TIME. (TOMMY)>> EVEN WITH THE TRACK PREP SPRAY ON THE SURFACE THAT WE'RE RUNNING, IT'S STILL HAVING TRACTION ISSUES. THAT GOES TO SHOW THAT WHEN YOU'RE ON THE STREET WITH A POWERFUL CAR, BE AWAY OF WHERE THAT SKINNY PEDAL'S AT. (MANK)>> WELL THAT WAS NICE AND STRAIGHT. (TOMMY)>> THERE YOU GO GUYS, WE TOOK A PLAIN JANE CAMARO AND KINDA DID OUR SPIN OF A COPO CAMARO, AND I TELL YOU ONE THING, THIS THING IS DEFINITELY ONE COOL RIDE. (MANK)>> GOT HER LOOKING GOOD AGAIN, IT'S PERFORMING BEYOND WHAT WE EVEN EXPECTED. IT'S BEEN A GOOD DAY, WHAT DO YOU THINK? (TOMMY)>> WELL I HATE TO EVEN HEAD BACK TO THE SHOP BUT I GUESS WE PROBABLY OUGHT TO. (MANK)>> IT USUALLY TAKES LIKE AN HOUR TO GET BACK, I'M THINKING 90 MINUTES MAYBE. (TOMMY)>> IT IS GEARED KINDA LIKE A TRACTOR. (MANK)>> SEE YOU GUYS NEXT TIME ON POWERBLOCK.